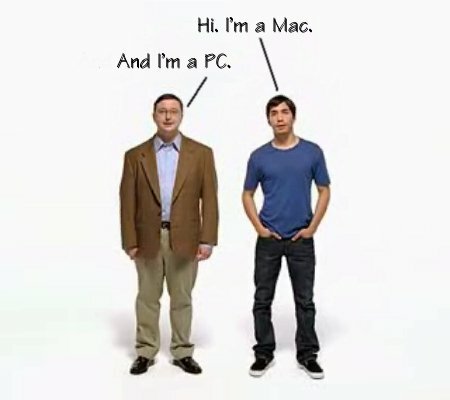 Is B2B a PC or a Mac? For me, it’s kind of a silly debate. I mean, we’re all marketers. The real difference is what product or category you work in. Not who you’re targeting. I spent my the first 10 years of my career working in B2C then the last 7 in B2B. So, I guess I have a unique perspective on this topic. 1) We’re all marketing to people: The term “business to business” is actually misleading. You’re really not marketing to a business. You’re marketing to the people within that business who make decisions on buying products and services. Those people have the same needs and emotions as someone standing in a grocery store buying a bottle of detergent. 2) We’re all focused on understanding our target: Both B2B and B2C marketers work hard to understand their target audiences. We do a lot of research and segmentation to make sure we have the right insights that will stimulate some kind of response. Having spent way too much time in my career behind the double-sided mirror in focus groups, I can tell you that you can get just a good insights from a B2B focus group as a B2C focus group. 3) We’re all trying to create great work that breaks through the clutter: Whether you’re B2B or B2C, you’re trying to develop great marketing that connects with your audience. I’ll admit that B2C brands often have a bit more fun, but that doesn’t mean B2B advertising is any less effective or creative. I’m currently judging the Business Marketing Association awards and I’m amazed (but not surprised) at how much great work is being done in the B2B space. In case you need more proof, check out the great spot from Corning below. It’s had 23 million views on YouTube. Not too shabby for B2B. 4) We’re all struggling with the rapid changes in media and technology: When I talk to marketers and attend conferences, there’s a consistent theme: We’re all trying to figure out the new media landscape – social, mobile, ad networks, programmatic buying, big data, marketing automation, etc. No one has cracked the code. Technology has totally changed the game for marketers. Today, we’re all dealing with much more complexity than every before. And, we’re being asked to wear more hats. Some days I feel like I’m the IT guy because I’m spending so much time and money managing technology. Whether you’re B2B or B2C, this is the new normal for marketers. It couldn’t be simpler, right? 5) We’re all focused on the driving results: I’ve never met a marketer who isn’t focused on driving results. That’s why we do what we do. Of course, the results will be different across products, categories or industries. When I was doing advertising for the Tide brand, we were focused on improving key metrics like brand favorability and purchase intent because we knew that would eventually lead to more sales. In my current role at PGi, I’m laser focused on finding prospects through our ad campaigns and converting them to customers right away. It’s more of a direct approach than what I did on the Tide brand, but at the end of the day, you’re always trying to improve results, whether it’s sales,awareness or other metrics. I guess there is one big difference between B2B and B2C – the budgets. When you look at lists of the top advertisers, you don’t see many B2B brands on the list except maybe IBM and GE. But big budgets don’t always equal big ideas. Sometimes the brands that do more with less can be much more creative. So my message to all marketers: Let’s stop the silly bickering about B2B vs. B2C and let’s start learning from each other. You just never know where great ideas will come from. ← What Would Springsteen Do?